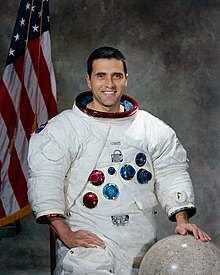 Dr. Harrison Hagan "Jack" Schmitt (born July 3, 1935) is an American geologist, retired NASA astronaut, university professor, former U.S. senator from New Mexico. He is the most recent living person to have walked on the Moon. As of 2018, he is also the last living crew member of Apollo 17. Schmitt resigned from NASA in August 1975 in order to run for election to the United States Senate as a member from New Mexico. As the Republican. He lost his re-election campaign in 1982. ↑ "Apollo 17". NASA. Retrieved 29 June 2016. ↑ "Extravehicular Activity". NASA history. Retrieved 29 June 2016. ↑ "50 Years in Space - Harrison Schmitt". California Institute of Technology. Archived from the original on June 15, 2009. Retrieved June 16, 2009. This page was last changed on 4 October 2018, at 15:32.